All Replies on A shot at a older Performax Pro III 22-44 for $800. Hmm...hmm.....? A shot at a older Performax Pro III 22-44 for $800. Hmm...hmm.....? I think I was one of the first ones in Georgia to buy that sander back when it first came out in the early 90’s. Still have it and work it just about every day. Used it today to sand 6 end grain cutting boards. Your friend is about right on the price. I think mine was a little over $1300 with the out feed tables and casters for it. Mine has sanded many many 100 doors, furniture panels, table tops, cutting boards, and many other things. The only thing I’ve done to mine is replace the drive belt about 10 years ago, and I use only 120 grit paper on it. If it’s in good condition, I would jump on that $800 price in a heart beat. You can get a lot of different opinions about this, but my $$$$ says as long as it doesn’t say. or have anything to do with JET it’s a great tool, and if working without problems now, then you should expect some heavy use from it going forward. That isn’t to say I don’t like JET tools, I do, just not what they did to that line of wide belt sanders after they bought out ProMax. They dumped a whole lot of China on them, and it’s not infrequent to see my JET sander won’t….... However it is rare to see it said about a St Paul made tool. I have owned the sander you are talking about and they worked very well. The new line would probably be similar to their 25’s. The 19/38 are very well made. I currently have one of them, my dealings with the company have been excellent, and I wouldn’t hesitate to buy from them again. I say that tongue in cheek. They sell paper for their sanders, and it’s at highway robbery prices. If you get the sander I have had great luck getting the heavy duty paper rolls here. Look under cloth rolls Extra heavy weight, AO, the average price on 50 YARDS of paper is 60 bux Make 16+ rolls for what SM would charge for maybe 5 to 6 rolls. Plus the material will last several cleanings with a rubber stick, and still work fine. Good Stuff!!!! Grr… little white angel on my left shoulder says hold off. I’ve been tackling finances all year to get totally out of debt by end of the year (except mortgage). Tis why really haven’t brought any new machines to the house. So, cancel this message. I’ll have to pass. But come January…..
Fiscal responsibility, always a good trait. Except when ya can’t get new tools, then it’s a bummer at least until the next great deal comes along. They always do, sometimes ya just hate the wait between events. It seems when I hesitate to buy the first thing that comes around, something better comes along. I do have a 16-32 Performax Plus lined up for $375 possibly on Sunday. It’s much closer (the 24-44 is 3 hours distant). A little easier on the wallet. We shall see. Check the motor plate, to determine how old the machine is. Check the drive-belt (pulls the wood through the sander); if this is worn, you’ll need to replace it (the wood will simply slip ahead of the drum, rather than be pulled through). Also, check to see if table level adjustments are possible. 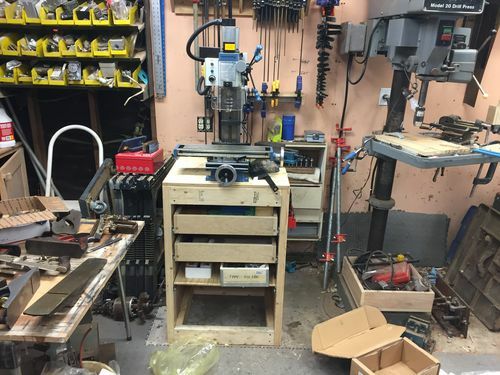 On the original machines, there was no adjustment to ensure the table is parallel to the sanding drum – and this makes it difficult to get an even cut. Just gave one away in my move to Washington. It was a great machine for what I paid for it. No issues at all. $800 might be a little steep, but I guess it depends on where you live. I passed on this machine. Instead, bought a $375 16-32 Performax that was more local and easier on the wallet. Maybe one day, a larger machine. But for the price tag of this little guy, I’ll work with that.